TS-BR: Available with a totally adjustable, removable rider backrest. 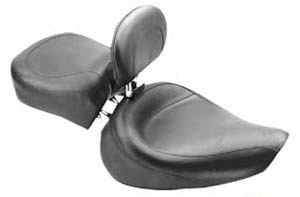 Recessed passenger seat can be used (or removed if you want a solo seat) for serious 2-up riding to allow for movement of the rider backrest. Braided edge skirt is incorporated. 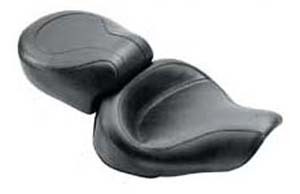 Rider seat width: 16.5", Passenger seat width: 12.5". Made in USA. TS-FB: Features a wider driver seat that is deeply pcketed to provide ample back support without rider backrest. Rear seat extends forward over the driver's seat to give additional back support. Rider width: 16.5", Passenger width: 2.5". Made in USA.